"Light, little, and loud" was the d&b audiotechnik reputation around the 2013 Broadway Sound Master Classes. Every year, BSMC hosts students and professionals for a weekend of audio education and networking at NYU Tisch School of the Arts. Two full days of classes are concluded every year with a closing cocktail party and renowned industry awards ceremony, at which the d&b audiotechnik V-Series was honored with the Live Design Sound Product of the Year award. "We are thrilled to be receiving this," said NE regional manager, Michael Eisenberg, who accepted the award on behalf of d&b. It was presented in the category of 'Sound: loudspeaker,' though part of the d&b allure is their ability to provide complete sound systems. "The goal is to provide a full service for our clients. Of course we offer loudspeakers, but we also provide amplifiers, software, monitors, subwoofers as well as a full range of accessories. 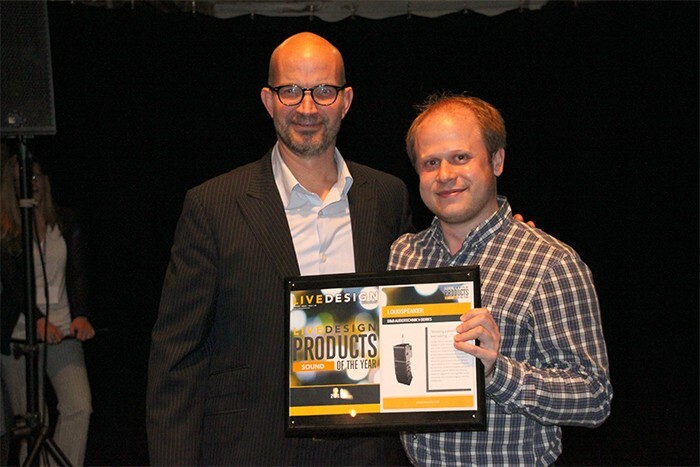 We actually won this same award a few years ago for the innovative B4 cardioid subwoofer and now the V-Series is deservedly having its hay day." While the V-Series has been well accepted in the community since its introduction, Eisenberg admits "receiving the recognition from our peers is great. It's a celebration of the designers, engineers, audiences and all the people worldwide who support the d&b System reality."